This Barbour waxed cotton vest was inspired by the French hunters jackets, an elegant timeless style. 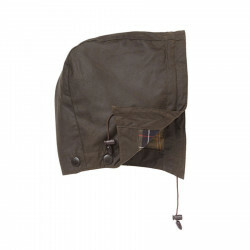 Created in 1983, this jacket is typical of Barbour, it is strong enought for great escapes, but also easy to wear in town. It has a 100% tartan cotton lining, iconic symbol of the brand, with a double closure: zip closure with pressure buttons, wind protector. This Beaufort vest can also have a padded lining when it gets colder. The velcro bindings at cuffs protects from wind. The corduroy velvet collar is very soft with pression button for a hood. Two hand pockets on sides with pocket hand warmers with moleskin lining brings warmth in cold days. It also has a pocket inside in the back double in nylon. Sizes can be available in our stores, please contact our Customer Service at 02.98.85.47.37. 100% waxed cotton. Inside tartan lining 100% cotton.